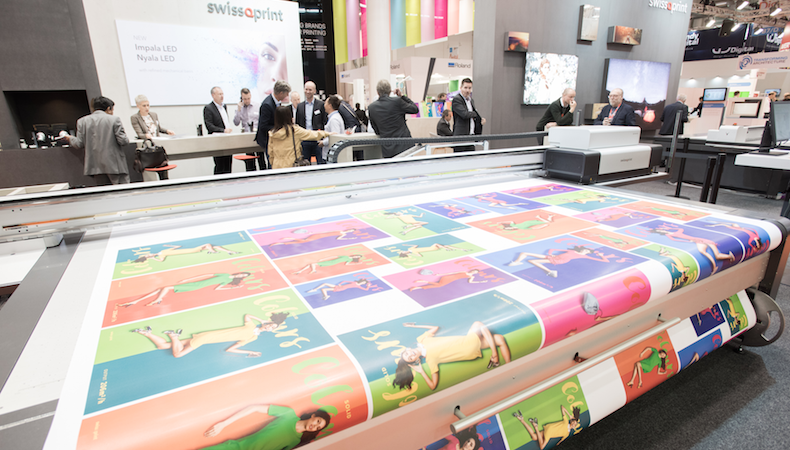 Wide format manufacturer SwissQprint is celebrating its 10th anniversary and is eyeing up more export success in a bid to continue to prosper. This week, the company has completed a decade of presence in the industry and it has recently celebrated its milestone ’10 Years Anniversary’. SwissQprint now operates in 40 countries, owns three subsidiaries and counts 110 employees. The name swissQprint surfaced out of nowhere 10 years ago. Today, the brand is a byword for digital printing systems boasting high quality, huge versatility and Swiss reliability. Reto Eicher, Hansjörg Untersander and Roland Fetting laid the foundation for this success story in September 2007. A decade later in 2017, there are now 75 people working at the head office and production base in Switzerland, and 35 spread across three subsidiaries. In addition, there are sales and service partners representing swissQprint in close to 40 countries around the globe. From the outset, swissQprint has focused exclusively on UV flatbed printers with modular design. Modularity makes the base machine configurable and extensible according to customer needs. Oryx was the first model to reach the market, celebrating its premiére in 2008. Just two years later , he company surprised the market with a new high-end flatbed inkjet printer, the 134sqm per hour Impala. The machine featured 18 Konica Minolta printheads and could handle a wide variety of roll-fed and sheet substrates, up to 2.5x4 metres. Nyala, the largest model built until that date, made its debut in 2012. Another two years on, swissQprint launched the second generation of its printers with the launch of the Oryx 2 and Impala 2 at FESPA 2015. The two new UV large-format printers have a 25% larger bed size than the previous versions, at 2.5x2m. In early 2017, the company brought to the market two new “4x4” flatbed printers that came configured with quadruple CMYK printheads and were showcased for the first time at FESPA 2017 in Hamburg. The UV machines, which are said to be suitable for screen printers as well as booth builders and large-scale digital print firms, can be used to produce high-quality POS items, displays, posters and banners. The 4x4 models of the Nyala 2 (3.2x2m flatbed) and Impala 2 (2.5x2m flatbed) series retain the same quality as the existing 2xCMYK models, but are around twice as fast. The machines are modular and field upgradable, if users later wish to add options such as the roll-to-roll functionality. Congratulations and a huge thank you to swissQprint and its founders Roland Fetting, Reto Eicher, and Hansjörg Untersander for such a great expansion. The event, taking place from 16-18 November at the Centro Citibanamex in Mexico City, has become the largest dedicated exhibition for the wide-format digital printing, screen printing, signage and garment decoration industries in Mexico and Central America.